This particular oversized button-up has traveled all across Europe and the states with me serving its purpose as my go-to lightweight travel jacket. If clothes could speak this particular piece would have stories of its own. With Fall settling in I’ve attracted my closet with pieces great for layering: camis, long sleeved shirts, button-ups, sweaters and etc. Likewise, there’s also been a gravitational shift towards fall colors such as army green and burgundy especially since they compliment neutrals quite well. 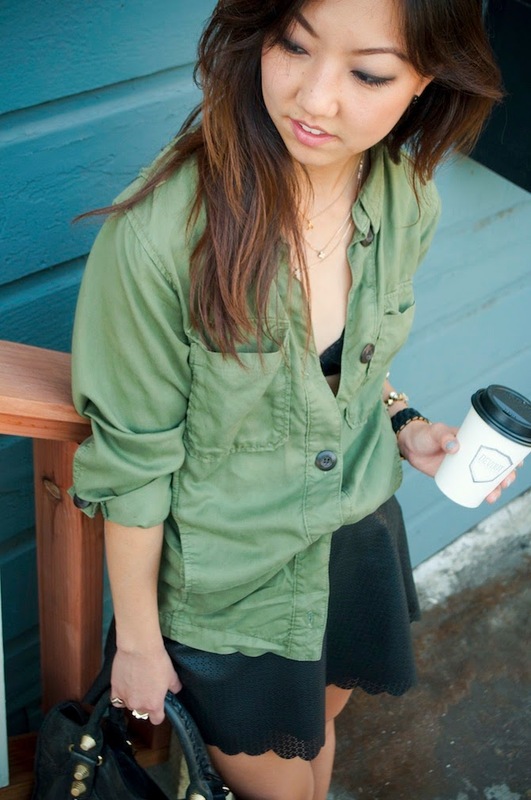 Because it’s finally starting to feel like Fall in California, I’m expecting more layering and fall colors in my life starting with this oversized army shirt. How gorgeous! That skirt is super pretty. Gorgeous oversized top! You look phenomenal and your styling is perfectly on point. super cute! wish it was warm enough to wear that cute look!